When Adolf Hitler is afraid of something, people take notice…but what could be so horrendous as to terrify the most evil man in all history? 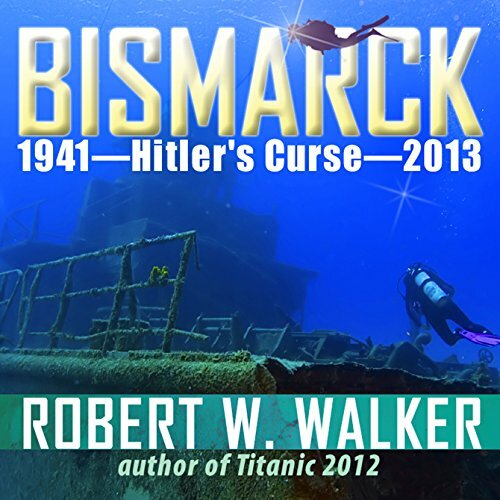 Bismarck 2013 is two novels in one, each story alternating between the two time periods, one being 1941 and Germany's attempt to control the North Atlantic shipping lanes when the infamous Bismarck is mysteriously sunk. History provides one answer to why and how the huge battlesthip was sent to her watery grave. At the same time, story number two is set in the future of 2013 when salvage operation divers go into the interior of the sunken destroyer named Bismarck. In 1941, Hitler ostensibly visits to inspect the Kriegsmariners, but he secretively leaves an unusual metal box hidden on board the infamous German battleship with the proviso the admiral drop the little "coffin" in the deepest part of the North Atlantic. The top-secret mission Bismarck is on is soon compromised by Hitler's curse as well as a German-born British spy named Hulsing, a Lt. Commander on board who is soon drawn into the mystery of the unusual box left by Hitler. Lt. Hulsing is soon witness to an outbreak of insanity among the ship's leaders and SS Officer Bonekemper. It was a ship destined to dominate the high seas in the name of Der Fuhrer and Nazi Germany, but that can't happen if the ship can't survive Hitler's Curse. Before it is over, Nazi naval officers are turned into mindless beings controlled by an entity of pure evil. In the future alternating chapters set in 2013, a huge salvage operation to plunder the sunken destroyer is well planned and organized until it slowly begins to crumble due to a curse older than 70 years. When divers Marshall Bradshaw, Deanna Burlingame, and four others go into and through the interior of the ship, they learn the superstitions surrounding the ship had their basis in fact! the well known story of Battleship Bismarck and it's sinking in 1941 is effectively overwritten and interwoven with this work of fiction. nicely narrated and with the addition of characterisation made almost realistic. Being a history lover it was a step too far for me but once started I did stick with it and see it through to the finish.